We undertake file recovery, Migration, Conversion or Transfer of files and scanned document images from Softco PCDOC Cache ccache/cc00001.bin files. In cases when data is very sensitive and confidential we can under take this work at your offices any where in the world. Alternatively you can ship the optical disks to us. We have worked with many engineering, military, financial services to provide a copy of the PCDOC data in an easily converted file. We convert from the PC-Doc scanned files to say TIF (TIFF), PDF or other graphic formats. This makes it easy to retrieve the files on any modern PC. We can convert the metadata in the PC-Doc database to say and Excel table / CSV / Access for importing into your new document management system or simply for use as stand-alone. When the PC-Doc system was used to store regular files as opposed to scanner output, we can extract files to any hard drive (like a windows PC formatted drive) so you can open the files just like any other file. Many of our PC-Doc conversions are used on NAS or networked device to give easy access of this archive PC-Doc data by anyone in your organisation via intranet, internet or web based applications. PC-Doc was developed by Danish company Dansk Informations Teknologi A/S DIT and was a Electronic Document Management System (EDMS) / Electronic Filing System (EFS) / Document Imaging System (DIP). PC-DOC was sold through Softco. The system could either store scanned documents or regular files (like Word, Excel, PDF or any other computer file). It usually had a scanner attached to a PC usually running Windows NT, together with a database for storing file metadata. The software licence was usually controlled by a dongle. The files were stored on Hard Disk Drive Cache files or Magneto Optical Disks (MO). PC Doc database convert to csv, excel or access. The PC Doc system has its own database and it appears to us to be proprietary system and no documentation available on its structure. Therefore we wrote our own program to retrieve the data to allow you to use your data in a new system. The database stores the metadata for the files that are scanned or saved to the PC Doc system. Sometimes the system is set up to use an external database like My Sql or MS SQL in which case you can probably produce us a text listing so we can name the files in a meaningful manner. - Extract data from an existing SoftCo 7 application. - Our customer wants to replace the current Softco R7 solution to Documentum. - Softco R7 platform has very strict rules to extract information and very limited development options - need help to release the data. - The Softco system stores the information in the 4GB chunks and additional database files for metadata tag information. - I need to convert data from archiving system of Softco, pcdoc. - There are some files with extension BIN(4 GB files) but need file conversion / extraction. - Copy files from PC-Doc central cache ccache .bin files to hard drive or DVDs. - Data extraction from SoftCo/PCDOC Archive information: Central Cache consist of 4 files, each 4GB. - We have SoftCo 7 and data stored in cache files which have to be exported to cloud offsite storage. - I require Image extraction from Document Imaging System for import in to a new EDMS. - Can you transfer the data from the cache files into a more managable system ! - PCDOC file extract to TIFF files. - SOFTCO PCDOC migration solution required. - Files are stored in cache files cc00001.bin etc on harddisks. - Our problem is that we can not extract the cache data (TIFF images) with the correct metadata. - Convert PC Doc database to csv, excel or access. - Extract data from cache files require software to convert pcdoc. There are several variants of PC-DOC, the 2 most common are PCDocSe and PCDOCSG. Other PCDOC variants are PCDOCSA PCDOCSB PCDOCSC PCDOCSD PCDOCSF PCDOCSH. pcdoc central cache cc00001.bin files problems that we recover data from are listed below. pcdoc files conversion, pcdoc files transfer, pcdoc files migration, pcdoc files recovery, pcdoc bin files, pcdoc cache files,pcdoc central cache. 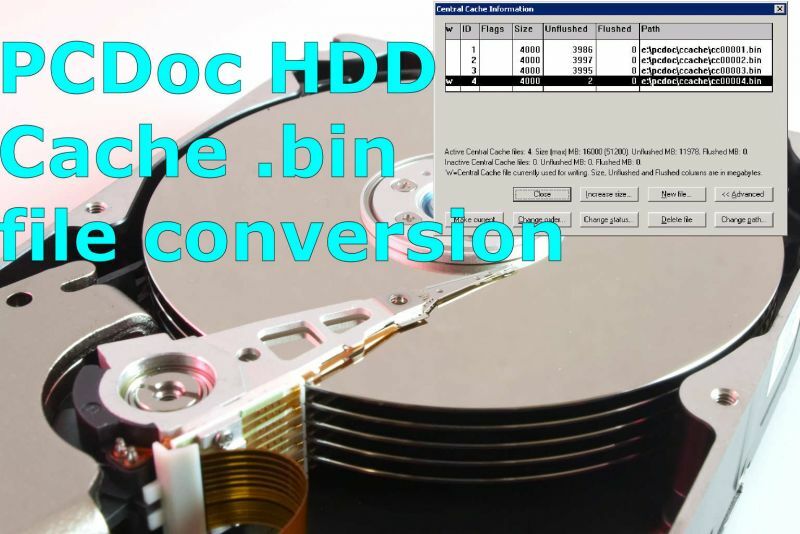 Converting PCDOC hard disks drive ccache cc00001.bin hdd hard disk C: drive cache files converting migrating transferring to PDF TIF TIFF and data recovery.